The Battlestar Galactica Season 3 Archive Box includes a base set, all pack-inserted bonus card sets, and the 2-case incentive Tricia Helfer autograph/costume card. The case topper card and 6-case incentive card are NOT included. The Cylons were created by man. They Rebelled. They Evolved. They Look and Feel Human. Someare programmed to think they are Human. 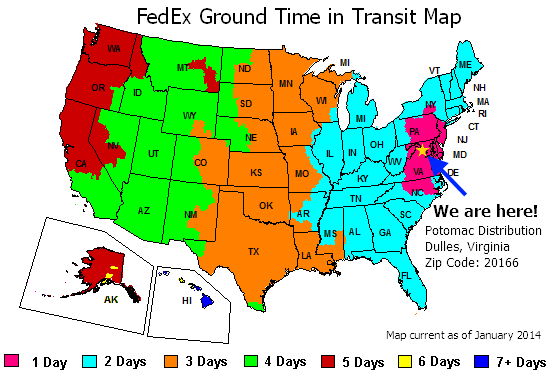 There are many copies and they have a plan. Winner of the prestigious Peabody award for distinguished achievement in television,Battlestar Galactica continues to draw rave reviews from fans and criticsalike. 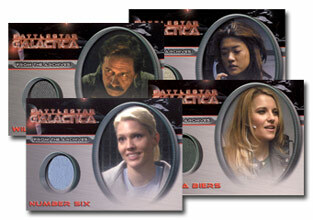 Relive the action, the drama, the struggles and the victories ofthis critically acclaimed show with Rittenhouse Archive's Battlestar Galactica SeasonThree trading cards. Each box will contain TWO autograph cards and onecostume card as well as at least one 72-card set covering all 20 episodesfrom the third season. Besides autograph cards, each box will contain one costume card from major characters includingNumber Six, D'anna Biers, Samuel Anders, Karl "Helo" Agathon, Sharon Valerii and Simon. Significant Seven - A 7-card analyzing the seven know humanoid cylon models. Love In War - 9-cards looking at the tenuous relationships that war bring between two people! Shelter Posters - 3-card set utilizing the advertising promotion art from the show. Each case will contain an exclusive autograph case topper card signed by Ronald D. Moore, the show'sexecutive producer and writer. 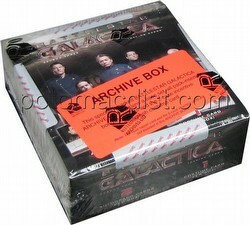 An exclusive collector's album will also be made available for Battlestar Galactica Season Three Trading Cardsand will come with an exclusive promo card. As an added bonus, for every 2 cases that customers pre-order they will receive an autographed costume card signed by Tricia Helfer asNumber Six and for every 6 cases that customers pre-order they will receive an autograph card signed by Edward James Olmos as William Adama.